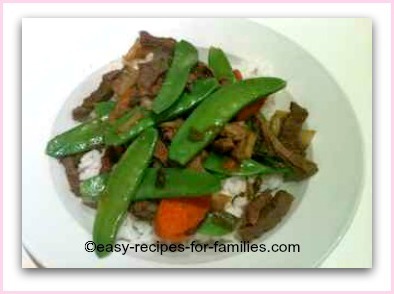 For quick, healthy easy recipes, you just cannot go past this 10 minute beef and vegetable meal. I whipped this up last night when I found the left overs I'd planned to reheat had been devoured by the hungry boys who visited my son. These strapping young fellows are constantly hungry and when they visit, I often find them looking in my pantry! I had no time to plan for a meal - so out came the topside sliced beef and whatever vegetables I had in the fridge. This dish is not just easy, it's healthy. ...and done in a matter of 10 minutes! 3. The vegetables are also lightly cooked retaining vitamins and minerals. This dish serves 4 persons. •	Add soy sauce, salt, pepper and sugar to taste. This meal is ever so quick to make and delicious. Always purchase good quality stir fry or sliced beef strips. Because it is quick cooking, the meat has to be sourced from a cut that's tender. You can't hide quality when the cooking process is swift. Always cook greens "lightly", that is, cook greens quickly in a hot pan and serve immediately. Over cooking greens will result in limp, soggy and yellow or grey looking greens.